https://codeocean.com/explore/capsules/ is where all Code Ocean capsules are listed. By default, they will be listed in reverse chronological order (newest capsules are first). Here, you can search for capsules by subject matter, title, tag, author, etc. Use quotes around terms to get exact matches. For a search by journal, the syntax is journal:"[NAME OF JOURNAL]" . 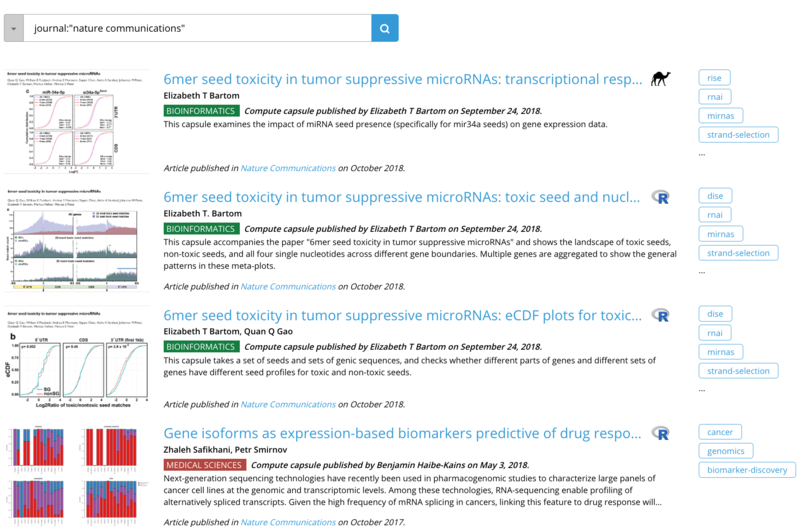 You can search by tag without quotation marks (tag:reproducibility ) or click a tag you see next to a capsule to search by that tag. You can also click the dropdown menu to choose between searching through all capsules or those with associated articles in their metadata. More advanced search options are in the works. Any specific requests can be made to support@codeocean.com.